After numerous sexual harassment and misconduct allegations, a number of Democratic Senators, led by Democratic women, called on Franken to resign. 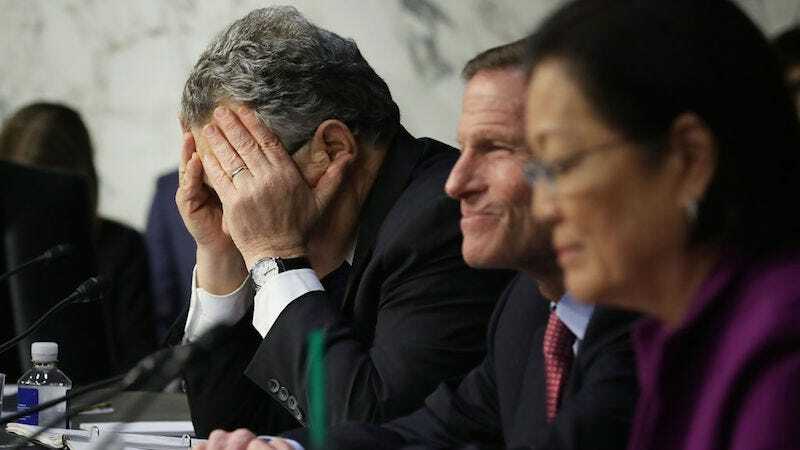 Shortly after, in early December, Franken announced in a speech from the Senate floor that he would resign “in the next few weeks.” Despite Franken’s refusal to set a precise date for his resignation, Minnesota Governor Mark Dayton appointed Lt. Gov. Tina Smith to fill Franken’s seat. Some Democrats apparently view Franken’s unclear timeline with a kind of “fleeting hope”—a chance to perhaps convince Franken to change his mind and remain in his seat. Two of the Democrats who spoke to Politico on background emphasized the pressure they felt to call on Franken to resign and subsequent regret. “In retrospect, I think we acted too fast,” one unnamed Senator told Politico. That sentiment was reportedly echoed by Leahy, who previously called on Franken to resign, in private conversations. If unnamed Senators pointed to pressure and regret, then Joe Manchin described the call for Franken’s resignation as “hypocritical.” Manchin called on Franken to rethink his resignation and for Senate colleagues to allow Franken to go through an Ethics Committee investigation. He reiterated that point of view in a Monday interview with CNN’s New Day. “I think that Al Franken should go through the process... due process,” Manchin told CNN. “I believe that we should have a process to where women can come out and be protected when they have been violated and they should be able to state that and be protected doing that and I believe that a person who has been accused ought to have a process that we can investigate thoroughly […],” he added, emphasizing his opinion that Franken should not resign.